The epic, multimillion-selling science-fiction series continues! 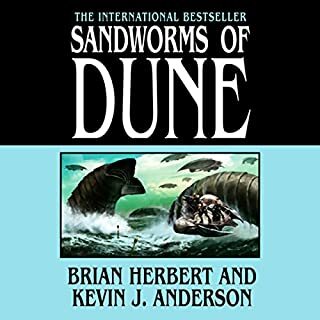 The second Dune installment explores new developments on the planet Arrakis, with its intricate social order and strange, threatening environment. 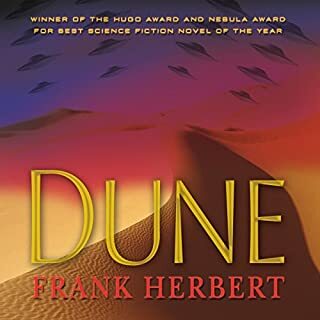 Dune Messiah picks up the story of the man known as Muad'Dib, heir to a power unimaginable, bringing to fruition an ambition of unparalleled scale: the centuries-old scheme to create a superbeing who reigns not in the heavens but among men. But the question is: DO all paths of glory lead to the grave? No emotion. Mispronounced words. Making one of my favorite stories boring, one chapter at a time. different narrators for different chapters? hey Audible, want a better version of this audio production? I'd be happy to do it. 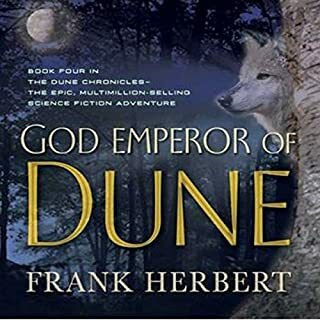 This is a great story, but as with the previous book the narrator changes intermittently, which is very jarring and breaks the immersion in my opinion. If there is some artistic reasoning behind it, then it escapes me. All the narrators were great and the story even better. 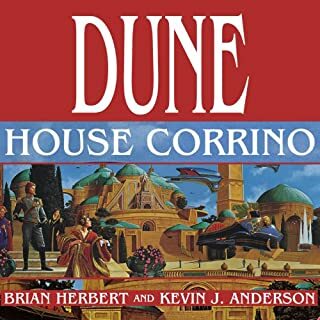 if I we're stuck on an island and I could only have three books it would be the dune books, the story is deep and the lore even deeper. 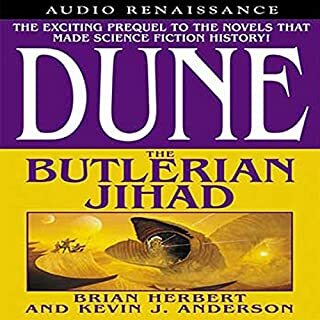 Just remember, "fear is the little death"
The story takes a while to develop and the presentation was nowhere near the calibre of Dune, but still an enjoyable listen. Bon livre, second dans sa saga. Ecoute facile, meilleure version disponible. I really did love the first title in the series, and plan to continue through the rest. There are 2 parts to any review of an audio book, the story and the narration, so let's break this into two. 1. The story. It was slow to get into, especially for a short book. It starts as a series of meetings, and slowly start pulling the story together. 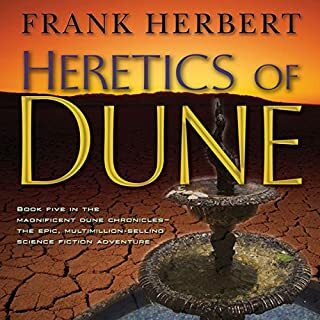 By about 3/4 of the way through you start to get back to what you excepted from Dune. It does a nice job telling the story of Paul, and over all was an enjoyable story. 3.5 stars. 2. The narration. I found it more than acceptable, and much better than many books. I was a little hesitant after reading some reviews, but it was no where near as bad as I had feared. It wasn't fantastic like the first book which truely is stellar. So I can understand how this would be a led down compared to that book. Over all it worked well and was an enjoyable listen, and it did not get in the way of the book, and may have even helped. When compared to other books 4/5 stars. 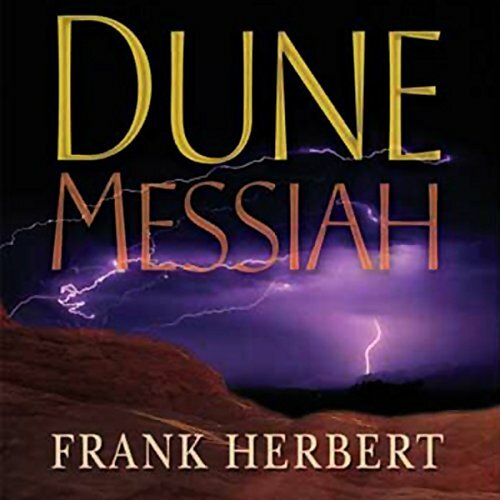 Dune Messiah is the sequel to Frank Herbert's masterpiece, Dune. As is often the case, it does not live up to the high standard of the first installement, but it is still pretty good. 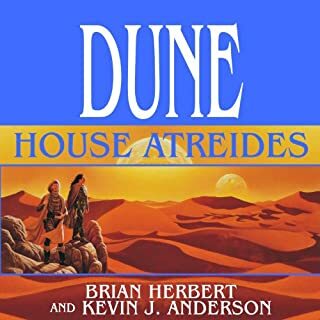 First off: if you haven't read/listened to Dune, ignore this book until you've done that. 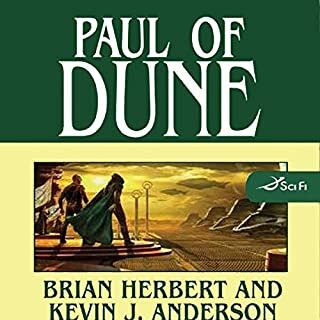 Dune Messiah is a bit more mystical than Dune, and focuses a great deal on some of the odder issues surrounding Paul's prescient visions and his sister, Alia, who is now in her teens. Overall, I give the story 3 stars...it's not a seminal work, like Dune, but it does follow up the original and bridge to the next few works. I am not as fond of the narration as I could be. There are several readers, and they each read a separate chapter. They are all great readers, and I love the idea, but it would have helped if the readers had some common ground rules. It's a minor quibble, but sometimes the characters (like Stilgar) have thick accents and at other times they do not. It makes it a little hard to keep track of who is speaking. 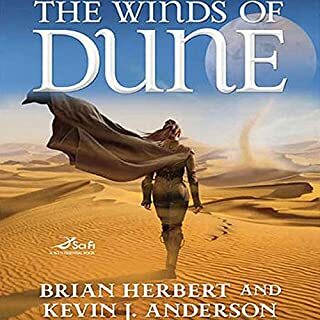 Dune Messiah is interesting to Dune fans only in that it carries forward the narrative and answers some of the questions from its predecessor, the masterpiece "Dune". However, judged on its merits as an adventure and sci-fi story, it is a failure. Except for one brief foray into the suburbs of Arrakeen, the action is completely static. It is a series of meetings, internal dialogues, and conversations between a small handful of characters. Boring. You feel like you're reading the notes of a board meeting. 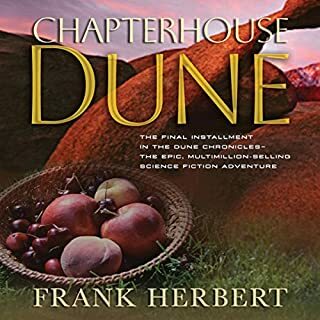 With the rich scenery of Dune, the jihad, and off-world conspiracies all exploding in the wings, it must have taken a real determined effort to squeeze the life out of this book. Informative without being interesting. 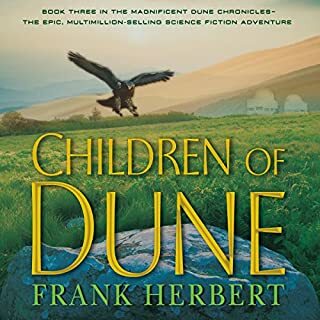 I’ve seen some critical reviews of this second book in the Dune series. 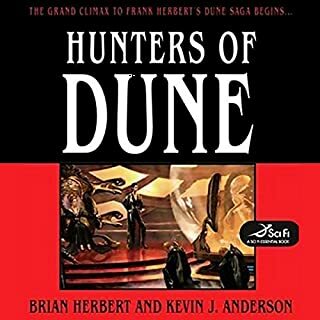 But, having read it right after re-reading Dune, I found I enjoyed it. As another commentator says, it reads like the conclusion (or “Part IV”) of Dune rather than a separate novel that stands on its own. 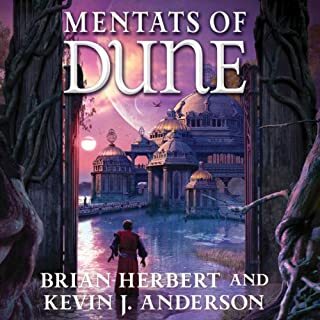 If you read it with that in mind, and if you enjoyed Dune, you will enjoy Dune Messiah. Some have criticised it for getting off to a slow start with lots of dialogue and set up. I agree, but the ending was satisfying and I was able to overlook the start. Hey, there are a number of good books that get off to slow starts (Lord of the Rings, for example), right? And by the end of this one, though, I had a very hard time putting it down. 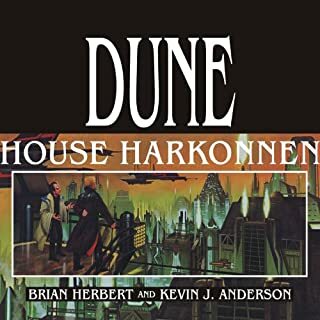 If you liked Dune and want to know how things pan out for our friend Paul, I recommend Dune Messiah to you. A Great saga marred by odd production. I would have preferred it if this was series was presented by a single talented reader narrating the books. I was however willing to accept what the previews state was done, a multiple reader version with different readers "performing" individual characters. Unfortunately what is actually delivered is a confusing third option, where sometimes a single reader narrates, and other times (seemingly at random) actors read specific characters. This disjointed production method causes nothing but distraction and prevents the listener from full immersion in the story. I could only speculate on why this inconsistent pattern is followed, but whatever the reason, the result is a less than stellar product. In addition, none of the actors really nails their respective parts. In fact, some are so distractingly bad (Piter for example) they cross over into embarrassing and cartoonish. 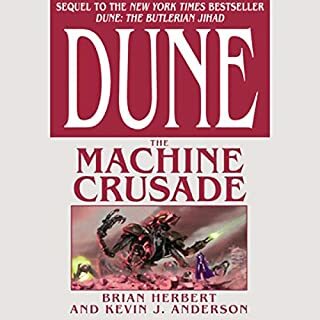 The original Dune Saga remains one of, if not my favorite books, but I am sorry to say that this production just does not deliver. I was hoping to acquire the entire series, but I am stopping here. 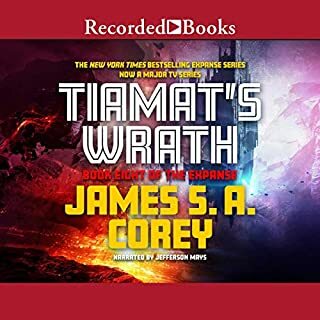 The first audio book in the series is completely engaging. This one is a bit of a let down. Reading the book is enjoyable. Listening to this one is almost painful at times. The changing narrator is an interesting idea, but doesn't come off well in practice. Also, the voices this time just don't capture the story this time. Likely this book was just too much exposition for the format. Overall, good story, but not a great listen. 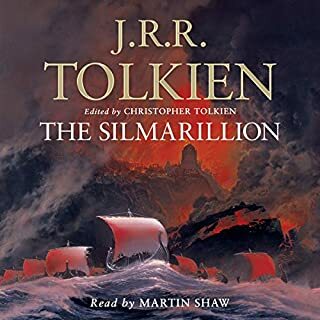 The only thing I didn't like about this audiobook was the multiple narrators. Their performances were good but I didn't see the point of having many. 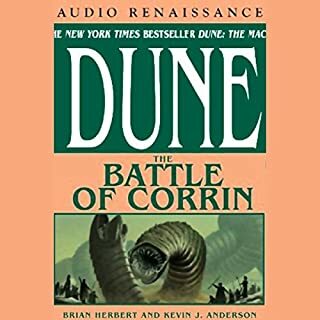 Dune is a sci-fi classic, so this review pertains to the audiobook version. They have a cast of different readers who perform the voices of the various characters along side the reader who narrates. But throughout the book, in new chapters, the cast of readers are suddenly absent, leaving the narrator to do all the voices, only to have the cast of readers eventually return in the following chapters. The effect is a major distraction: characters without accents suddenly have one; characters suddenly speak in a completely differnt tone, accent and manner. The is especially true with the character of Baron Harkonen, who at times has a deep menancing voice in the neighborhood of James Earl Jones, then other times, when the narrator is doing all the voices, the villian speaks with a higher, reedy, quicker voice and acquires a more pronounced British accent. After reading a lot of the reviews here, I expected this to be pretty boring. And while I'd agree that it starts out boring, it doesn't stay boring. It picks up speed as it goes and I found myself enjoying it more than expected. I'd say the first hour is pretty boring. The second half of the book is better than the first half. Overall, I gave it a 4 as I really found myself enjoying it. I'd say it's a 3.5 but I don't see it letting me choose half a star.